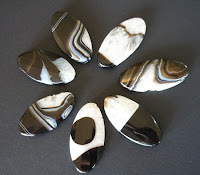 MiShel Designs: Tucson Gem/Bead Show Finds!! Wow! The 2010 Tucson Gem and Mineral Show (and, Bead Shows, too!) were fantastic this year - as usual. 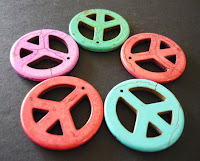 Each year we try to find some super "fun" things to bring back and play with like these super-cool multi-colored stones pictured above and the mod peace signs you see at the bottom of this post - how fun are these!?! We had a great time walking around and drooling over all the beautiful gemstones, beads, carvings, fossils and everything in between! We met some new people and swapped stories of "Who's got the best,......and what show are they at this year?" We chatted with some familiar faces and trusted vendors, watched cool demonstrations on Kumihimo Braiding, Stamping, Metal Etching, Pearl Knotting and much more! We've returned from Tucson and have finally 'cataloged' all our our items and wanted to share some of our cool treasures and also some of our "Just for the fun of it" finds with you as well. Majestic Pearl - Pearls, Pearls, and MORE Pearls!! 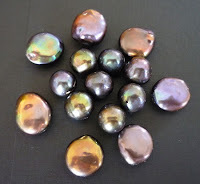 Pearl Concepts - Your guessed it - Pearls! 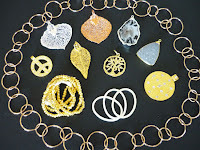 The Realm of the Goddess - 24k gold dipped leaves, chain galore, pendants, and more. Cargo Hold - Wonderful selection of pendants, chain and findings. 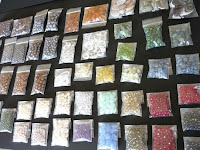 Beaducation - Geat supplier for metal stamping tools, online classes and jewelry supplies. Hip Chick Beads - Charms, clasps, stamping tools, connectors, etc. Object and Elements - Cool findings, great designs. 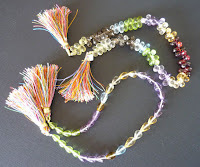 The Fiber Goddess - Exotic, hand-dyed fibers, kits for weaving/braiding cords, etc. Rio Grande - Catalog in Motion - way cool tools! Swarovski Crystal - Crystals, Crystals and more Crystals!! 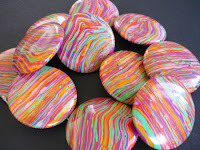 Bokamo Designs - Boro Glass Beads - Beauitufl!! Kent's Tools - Tools, tools, and more cool tools! 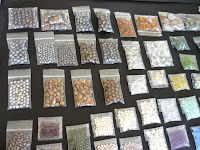 The Bead Palce - Beads, Beads, and more Beads! Queenly Global Trading - Beads, Crystals, Pendants and More! We've got some spring jewelry designs we'll be putting up on the website and our MiShel Designs Facebook Fan page in the next couple of weeks - so be on the look out!